If you see a grown man or woman riding around town on an overgrown scooter with a large front wheel, your eyes are not deceiving you. It might be world-class marathoner Matt Carpenter cross-training on his Kickbike, a state-of-the-art scooter with handbrakes. Or it could be someone he sold one to, for Carpenter is also a distributor of the Kickbike, which is relatively new to the United States but popular in Europe. Carpenter, the record holder in the Pikes Peak Marathon, has had his Kickbike for only about a month but already has integrated it into his training regimen. He finds it especially useful after races because the workout achieved on a Kickbike is close to running but without the shock. I just finished this really long race in Italy and I was really sore. I could use the Kickbike and still work out, Carpenter says. Runner Matt Carpenter uses his new Kickbike, a high-tech skate-board/scooter, to cross-train and to go to the grocery store. The Kickbike is a good cross-training tool for runners, says Harald Fricker, president of Kickbike USA, whose Eagle distributorship is the sole distributor for North America. It uses the same muscles, yet is lower impact and it really re-creates running for them, says Fricker, a long-distance runner himself. In fact, a Kickbike workout uses even more muscles than running, Fricker says. The Kickbike is propelled by pushing off with alternate legs in a motion very similar to running. Carpenter views his Kickbike as another toy to add to his collection. Thats the neatest part for me, keeping it fun, he says. This is fun for me because you get such a crazy workout. Going uphill on that thing is almost harder than biking or running. 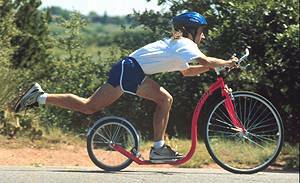 The Kickbike was developed in the last 10 years in Finland by physiologist Hannu Vierikko. In Europe, organized competitions include a Kickbike division nearly every weekend, according to Fricker. America is just catching on, but Fricker expects the process to be rapid. Kickbikes have been distributed in the United States and Canada since early July. After a little more than two weeks, 250 Kickbikes had been shipped out, at least one to every state, he says. Were already talking to race promoters throughout the country, and we have races planned in Boulder, Denver and Colorado Springs for next spring and summer, Fricker says. How can they charge so much for a scooter? It is most likely that scooters from your childhood were not made of high-tech bicycle components like aluminum alloy handlebars and a full-sized bicycle wheel in the front. Fricker says Kickbikes use Trans X components, which are found in many high-end mountain bikes. In addition to being a great workout, the Kickbike is also a good way to get around. I use mine to go to the grocery store, Carpenter says. He also says if he were in college, he would use a Kickbike to get from class to class. Apparently, Kickbike manufacturers have thought of that as well: They make book baskets that attach on the front. Unlike bicycles, Kickbikes do not have chains or gears and so are very clean and lack the dreaded bicycle grease. They are also compact, weighing 19 pounds. Fricker says two can fit in the trunk of any car. When Carpenter says the Kickbike delivers a good workout, he isnt kidding. Over hilly terrain, 20 minutes on a Kickbike is equal to about 1 hour 15 minutes on a road bike, Fricker says. But for those not concerned with calories, the Kickbike is lots of fun, kind of like a high-tech skateboard/scooter. Check out the Kickbike International Website at http://www.kickbike.com.